Qi (also seen to as “Chi”, “Ki”, and “Ch’i”) is the active energetic principle that forms part of every living thing It is the intangible but very real spiritual energy or life force underlying all living beings. Though it has no literal translation in English, it is most closely translated as “breath” or “air” or “vapor”, and often referred to as “energy flow”, “cosmic energy” or “life force”, Qi regulates a person’s physical, mental, emotional, and spiritual balance and well-being. In traditional Chinese medicine, the body is seen as having various channels or “meridians” through which Qi circulates, providing wellness and vitality to all the body’s various muscles, organs, nerves, and other biological systems. When the free and uninterrupted flow of Qi is somehow obstructed, disrupted, or imbalanced, however, it can lead to symptoms of illness and disease, often specifically concentrated around that part or system of the body which that particular meridian is associated with. Think of Qi, for a moment, like water, and meridians as the river it flows through. That river supports all types of life, and as long as it’s flowing smoothly and freely, that life will flourish. But if beavers dam up that river, then the riverbed will dry up and all the life it supports will start to die. If, on the other hand, a great storm comes and floods the river, then it may overflow, upsetting the ecosystem supporting that life, possibly drowning some creatures and tossing others to the shore. In either case, the only way to restore the healthy ecology of that river is to bring its flow of water back into balance. This is essentially how Qi and the 12 meridians operate. According to traditional Chinese medicine, all illness and disease can be sourced, and therefore remedied or alleviated, at the level of Qi. Plainly put, an imbalance in one’s Qi can lead to an imbalance in one’s well-being. The medical science of acupuncture is one time-tested and proven method for clearing such blockages, resolving energetic deficiencies, and reestablishing the free flow of Qi throughout the body. Acupuncturists delicately insert thin metal needles at specific sites in these meridians, most appropriate for achieving the individual’s desired results and optimal overall well-being. Whether it’s to eliminate pain or cease smoking, all physiological and psychological conditions can potentially be improved through the deliberate insertion of needles into these various meridians. There are approximately 2,000 acupuncture points on the body, all of which are connected through these 12 meridians. Qi flows through each of these meridians in a very specific direction. 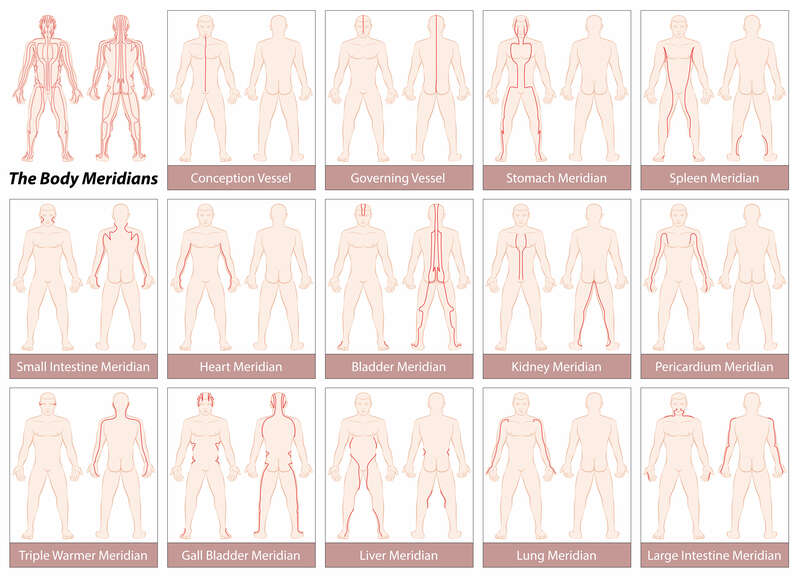 Some meridians run along the front of the body; some along the back. Some run along the arms; some along the legs. All meridians originate at a specific point on the body and terminate at another, each of these points being located at either the fingers, toes, head, or chest. Half of the meridians are associated with the Yin, female, negative principles of light; some with the Yang, male, positive principles of dark. Each meridian is also associated with one of the 5 elements: earth, water, fire, metal, or wood. For thousands of years, acupuncturists have used this knowledge of Qi and energy meridians to help people heal and restore balance in all areas of their health and life. Call our office at 773.878.7330 to see how we can help restore your balance. Our expert team members are here 6 days a week on evenings and weekends. We are located in the Andersonville neighborhood of Chicago.